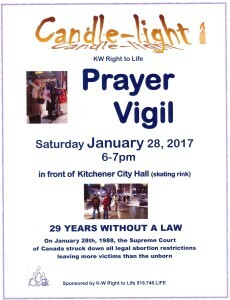 About 70 people attended the KW Right to Life Candle-Light Prayer Vigil on January 28th, 2017 in the cold damp evening …..
…..to pray and remember the millions of babies lost to abortion in Canada since the abortion law was struck down in 1988 leaving abortion on demand. 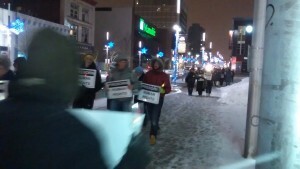 Sixty people walked and prayed holding candles and signs (PREBORN HUMAN RIGHTS). They were joined at 7 pm by an additional 10 people for adoration of the Blessed Sacrament and Benediction at nearby Our Lady of Sorrows Church. We were met by a group of students from Emmanuel Bible College who prayed over us and blessed our endeavour. January 28, 2017 Saturday’s Candle-light Prayer Vigil in front of Kit. City Hall. 6-7pm. On January 28, 1988 Canada’s abortion law was struck down leaving no protection for preborn babies at any stage of pregnancy. The Canadian Charter of Rights and Freedoms founding principal is based on the Supremacy of God and the right of the individual to life, liberty and security of the person. In order to accommodate the 1988 abortion law the rights of the preborn child were sacrificed for the ‘security of the person’ namely women and men who wanted to end the preborn’s life through abortion. This twist in the law has achieved its goal bringing to Canadians; abortion on demand for any reason including, social, economic, gender and disability of the baby in the womb. How secure are Canadians with this law in 2017? We know more about the value of preborn human life through ultrasound and medical advancement and clearly see the humanity of the preborn in a different light. We find a constant trail of broken lives of women and men who feel betrayed by the promise that abortion is the answer for their problem pregnancy. There are currently drug and substance abuse centres like DrugRehab.com that include care for women and men who suffer the emotional and psychological after-effects of abortion and have turned to substance abuse. Since 2012 Statistics Ontario no longer records abortion statistics leaving only those that are loosely incomplete and inaccurate. This downplays the numbers and effects of the procedure. Besides the lives of preborn babies being at risk from abortion now more than ever we see the security of post abortive women and men at risk from the consequences of abortion’s unnatural solution to pregnancy. A full house (about 120) for the KW RTL sponsored STOP SENSORSHIP TOUR Why Statistics Matter on January 14th 2017, K of C Hall Waterloo. They are visiting 9 cities and towns this month in Ontario. Mike Schouten from WeNeedaLaw.ca and John Sikkema, a lawyer from ARPA along with blogger Patricia Maloney are taking the Ontario Government to court over Section 65(5.7) of FIPPA on February 1st. In January, 2012, the Ontario government quietly slipped in an amendment to the provincial Freedom of Information and Protection of Privacy Act (FIPPA) whereby all information related to abortion is no longer accessible via an Access To Information and Privacy (ATIP) request. 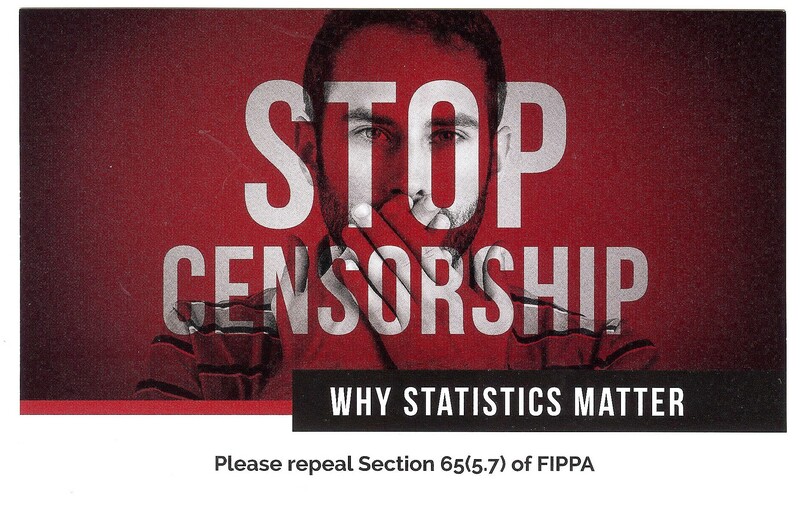 Section 65(5.7) reads: “This Act does not apply to records relating to the provision of abortion services.” Note that one of the FIPPA’s purposes is to guarantee access to government information to maintain transparency and accountability. Yet this addition undermines this purpose and was never debated in the Legislature. Patricia Maloney, a pro-life blogger who we have regular contact with and who has done excellent work using ATIPs, ran up against this roadblock in January 2014. When her request for statistical information was denied (under the new provision) she appealed the decision on her own, but lost. She then retained a lawyer on a pro bono basis and appealed again. After a third appeal, she finally received the information late last year. The government released this information to her “outside of the FIPPA process” mere days before her hearing in court. But the bad law remains on the books. ARPA Canada and Patricia Maloney are now challenging the law itself as unconstitutional. We have filed a notice of application asking the Ontario Superior Court to strike down section 65(5.7) of Ontario’s FIPPA. Freedom of Information is guaranteed under the Charter of Rights and Freedoms, falling under the freedom of expression protection. A successful Charter challenge would produce the information we are looking for, would require the Ontario legislature to amend the legislation, and would expose the extremism of the Ontario government in banning all information, including basic statistical information, from the citizens of Ontario in order to hide the injustice of abortion. © 2016 ARPA Canada. Articles from www.ARPACanada.ca that have been authored by ARPA Canada may be republished and used in full or in part elsewhere provided that attribution is given to ARPA Canada, including a link to site. 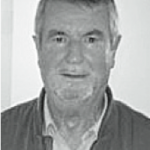 His initiative to investigate the outdated Personhood Law Section 223 (1) in relation to current medical scientific research and evidence was supported by 93 members of parliament. Denial of human equality is the greatest threat to democracy in Canada today. Categories of being human are never closed to tyranny and we should never accept any law that says someone you know to be a human being is not a human being. The United Nations Declaration of Human Rights recognizes the inherent dignity and inalienable rights of all members of the human family. It is the foundation of freedom, justice and peace in the world. Is there anything more important? Is abortion more important than the principle of human equality? How do we resolve rights between kinds of people? The state is not in a position to make that decision. Statistics Canada records 491 born alive abortion victims. No one was prosecuted. People are even purporting that children should be allowed to be euthanized up to age three years as they have not reached the stage of self awareness. 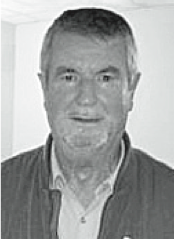 Stephen Woodworth resolved that the Parliament of Canada affirm that every Canadian law must be interpreted in a manner that recognizes in law the equal worth and dignity of everyone who is in fact a human being. All options should be reviewed in the light of science and medicine when there is reasonable doubt. In Canada, the Right to Life movement is concerned with the rights of the child and the rights of the mother in the abortion issue along with euthanasia. We recognize the ideology of the denial of personhood must be expounded to justify the killing. As does the history of eugenics based on race, gender and even consciousness. The last 100 years are rife with examples. Abortion, the current denial of personhood plays a particular role in today’s society for all the same reasons that eugenics did in the past. The difference is that a mother destroys her own child for the sake of expediency. Cold comfort for her and those involved in abortion. Every $50 pledged will receive a chance for a $150 gift certificate from McPhail’s. Prizes, draws, free balloons, good food. Meet old and new friends. Print out a sponsor sheet on page 3 of our latest issue of News+Views. February 23: “Choice” Chain Project is Coming to KW! Pro-lifers in the Kitchener-Waterloo areas will now have an exciting new way to engage our culture on the topic of abortion. KW & Area Right to Life Association is starting up a project called “Choice” Chain in our city which will run on a regular basis. I’m hoping you will come out to the training and spread the word on this great initiative. The project is designed to engage people who normally wouldn’t go out of their way to hear the pro-life message. Volunteers hold 3′ x 4′ signs that show images of children who have been killed by abortion and ultrasound images of living children at the same ages. The signs are displayed in public areas, such as sidewalks, where the volunteers can talk to people about the injustice of abortion. Check out this clip to see the positive impact “Choice” Chain can have! More information about the project can be found on the Canadian Centre for Bio-Ethical Reform’s (CCBR) website here. All volunteers must receive training in pro-life apologetics (how to converse effectively about abortion), the reasons we use this particular project and strategy, and project protocol. KW & Area Right to Life Association will be hosting this training by CCBR this month. After the training, there will be a short lunch break and then an opportunity to participate in the project and put that training to work! At 1:00pm we will meet in a public location (corner of Fairway Rd and Wilson Ave) for “Choice” Chain, which will run until 2:00pm. We encourage you to come to the training even if you are undecided about participating in “Choice” Chain. This is a great way to save lives and change minds and hearts about abortion. Also, as the use of graphic imagery is somewhat controversial in the pro-life movement, I encourage you to read this article entitled, “Why graphic images need to be displayed: from the woman who took the photos” addressing some common objections. Thanks for your consideration and for all you do for life. 25 YEARS WITHOUT A LAW – On January 28th, 1988, the Supreme Court of Canada struck down all legalabortion restrictions. Join us for prayer, fellowship, and learning on Monday, January 28, 2013 in Kitchener.